I certainly did. They were as essential to my youth as the Goosebumps series and Wacky Wednesday. The stories themselves were pretty basic and well-known urban legends. They were vague, to the point, and sometimes even silly (though trying not to be). And you can only read so many stories that end with “now jump at a nearby friend and scream! !” before you roll your eyes. But these seeming shortcomings were an added strength for the book. In most cases, illustrations are in place to serve the story. In the case of Scary Stories to Tell in the Dark, it was definitely the other way around. But, at the same time – at a young age, and in the right frame of mind – the stories were chilling, and even sometimes disturbing, due in no small part to the incredibly strange and often surreal illustrations by Stephen Gammell. His approach to illustration was very nontraditional – especially for children’s literature. To sound like an elitist hipster douche bag for a second, his work in the Scary Stories to Tell in the Dark collection was very reminiscent of Dali, and Bosch before him. His interpretations of any particular story’s monsters were horrifying enough, but even human beings depicted normally within the confines of the tale suddenly became misshapen characters born from a nightmare. Occasionally there would be an illustration that had so little to do with the events of the story that it made the happenings that much more off-putting and unnerving. For instance, in one of the most famous stories not just in the book, but in folklore itself, a girl named Susanna returns home to her college apartment to see that her roommate, Jane (in their shared bedroom), is sleeping. Susanna quietly undresses in the dark and slips into bed, only to be jarred awake several times during the night to someone singing “Oh, Susanna.” She repeatedly tells Jane to STFU. Yada yada yada, skip to the morning, and someone is still singing that song. Susanna flips out, jumps out of bed, and tears the covers off her roommate to see that she is dead. And the illustration that accompanies this tale? Yeah. What exactly is that? But…it somehow works. At the very end of this story, when the poor girl is assaulted with the sight of her mutilated friend on a bed only a few feet away, and the impossible sound of singing still fresh in her ears, perhaps Susanna has gone mad. And perhaps what you see is Gammell’s interpretation of madness. Or perhaps he is suggesting that we’re not in control of our own lives, and are helpless to defend ourselves against the dark forces that look down upon us from unseen places. Perhaps he is telling us there is only fate – not free will – that will determine our paths…and that we are doomed. Either/or – the friggin’ creeps. Flipping through the pages of Scary Stories to Tell in the Dark, the pictures you see before you could very well instead be hanging in a museum – and you would never think twice about their inclusion in artistic history, alongside other famous works by other famous artists. 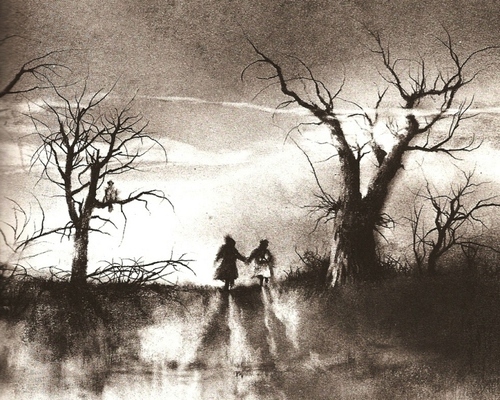 One of my personal favorite illustrations of Stephen Gammell is below – one which accompanies a story called “The Drum,” perhaps the eeriest story in any of the three books. Two young children – a brother and sister – become terrible nuisances to their mother, at the behest of a young gypsy girl who possesses a strange drum for which the siblings yearn. Their mother threatens to abandoned them – to leave them with a strange woman, who has glass eyes and a wooden tail. The siblings, though fearful of this threat, continue to misbehave in order to finally possess the strange drum. At story’s end, the gypsy girl explains that it was all just a game, and she never had any intention of giving up her drum. The siblings rush home…and see their new mother waiting for them in front of the roaring fireplace – their new mother with glass eyes and a wooden tail that thumps against the floor. The painting below is entitled “Carnival Night” (1886) by Henri Rousseau. The similarities, whether intentional or not, show that Gammell has not just a modern illustrator’s mind, but that of a classic artist. As of this writing, Gammell still provides illustrations for childrens’ books, and though Alvin Schwartz, who compiled the tales for the Scary Stories to Tell in the Dark books, has long since passed on, perhaps a fourth book will some day come down the pike under new guidance. And with it will come nightmares for a new generation of dark-seeking children.